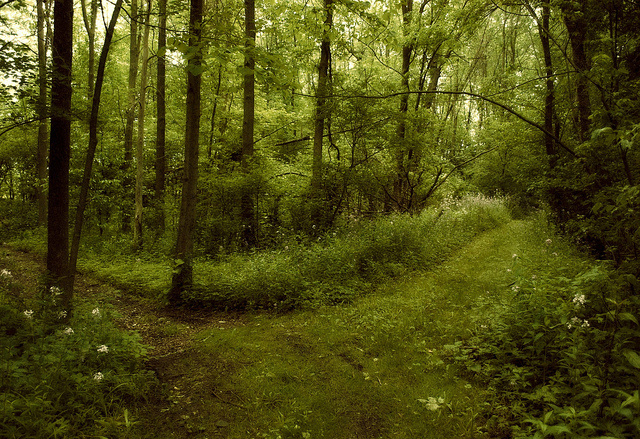 Robert Frost’s famous poem, The Road Not Taken, begins with his contemplation of “two roads diverg[ing] in a yellow wood,” and his indecision about whether to follow one path or the other. In the end, the author chooses what he deems “the path less traveled by.” Yet one must wonder whether another option was available? What about a possible third (or fourth or fifth) road? What about roads that have yet to be created? Sometimes, when conducting genealogical research, one must be aware of the possibility of other roads, as the mechanisms for knowing whether they exist may not yet have been developed. Occasionally, then, one must be willing to get off the known path to explore other, hidden roads. For example, during a library visit last week, a patron came to NEHGS to examine some LDS microfilms from Ireland and Austria. She expressed her excitement at the possibility of discovering more about her Eastern European ancestors, especially her great-grandfather, Henry Franklin Short, who had been an impossible brick wall until recently. According to the patron, she was able to break through this brick wall with modern DNA testing. The patron explained that she and her sisters joined two popular DNA companies about a year ago, in an effort to learn more about their British and Irish roots. Up until this point, the sisters were only able to locate documentation showing they were descendants of families from the British Isles; no other records showed different ethnic groups/locations associated with the family. Yet when the sisters received their DNA results, a surprising fact was revealed: one of the companies determined that the sisters were 12-15% Eastern European. Additionally, one of the sisters had a match with an individual described as a third to fourth cousin. The sisters quickly contacted the cousin, and provided the individual with all of the known information about their great-grandfather, as he was the best candidate given his mysterious past. They stated that Henry Franklin Short had been absent from the records prior to marrying their great-grandmother in Malden, Massachusetts, when he identified his parents as Lee and Beatrice Short. No other documentation about Henry Franklin Short had been located before this event, which was recorded in the early twentieth century. Based on this limited information, the cousin recognized a possible connection through her grandmother, who often told stories about her brother Heinrich Friedman. According to the grandmother, Heinrich was kicked out of the house at the age of eighteen and subsequently moved to New York City. He had previously lived with his strict Jewish family in Czernowitz, Austria (now Ukraine), but often argued with his father about the stringent household rules (which may have led to his emigration to the United States). Most intriguingly, the cousin also revealed that her great-grandparents were named Leopold and Betty Friedman, similar to the names provided on Henry Franklin Short’s marriage record. Therefore, based on the family stories, historical documentation, and DNA evidence, it is very probable that Henry Franklin Short and Heinrich Friedman were one and same. Using this new evidence (and new name), the NEHGS patron can now return to the records in New York City and Massachusetts in an effort to locate Heinrich Friedman. Additionally, she can examine the LDS microfilm for Czernowitz to locate a possible birth record for Heinrich or his siblings. If found, this may help to solidify her connection to the Friedman family, a discovery that would have been impossible without the use of DNA evidence. Great story. Solving mysteries is one of my favorite parts of family research.